A fast-growing tree of the custard-apple family, growth can exceed an amazing 6-8 ft per year, attaining an average height of around 40 ft or so, with heights of some 140 ft! 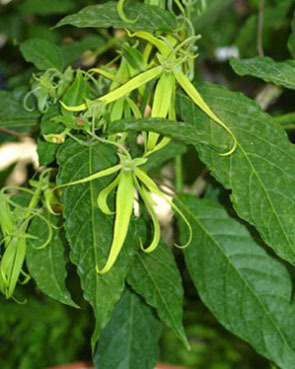 The Ylang Ylang is happy in full or partial sun, but prefers the acidic soil native to its normal rainforest climates, but is known to adapt quite well to other conditions. The long slender leaves are smooth and glossy, pointed with a prominent drip tip, offering subtle drooping yellow star shaped “flower” clusters that yield a highly fragrant essential oil. Specimens typically bloom two times a year, though mature specimens are known to bloom almost continuously throughout the year. Flowers are very fragrant, with a greenish yellow color at first, turning to a deep yellow to yellow brown when mature. Its clusters of black fruit are also important food items for birds, bats, monkeys, squirrels and other small mammals that frequent the rainforest readily dispersing this non-invasive species of tree. Author: Kimberly Barron, originally from Malibu, California has lived in Parismina and Manuel Antonio, Costa Rica for 20 years. Starting as a certified tour guide, she spent 15 years managing fishing lodges on the Caribbean Coast and later 4* & 5* Hotels on the Pacific Coast of Costa Rica. Currently semi-retired, Kimberly still works as the Marketing Director for Byblos Resort & Casino and Hotel and Hotel Makanda by the Sea. Nails Down a Chalkboard Style Music in Costa Rica……and yet we still love our Marito Mortadela! Ññññeee! Ñññññeeee!! Ññññññññeeeee!!! clin-clin-clin-clin-clin-clin is the sound his Ukulele/Guitar plays in a constant, grating rhythm accompanied by completely unintelligible “singing”. Mesmerized, you stop to look, listen, and try to make sense of at least one or two of the words, but the only sound you can truly make out is the incessant sound of Ññññeee, which is repeated countless times in a day on this dedicated spot located on Avenida Central and Calle Uno in downtown San Jose, Costa Rica. I’m speaking of the beloved street “artist”, Marito Mortadela!! For those not familiar with this musical “icon”, he is Costa Rica’s own Latin American Idol wannabe (remember American Idol’s William Hung? ), and your only excuse for not knowing of him would be that you have never walked the Central Avenue boardwalk, where precious Morita has been a fixture for some 40 years. For those that have paused to experience his unique sound, comparable to fingernails running down a chalkboard, Marito, though mostly blind, is known for his quick wit and his endearing happy demeanor, making him one of the most beloved persons in San Jose, as he plucks away at his ukulele. An introverted man who has never offended even the cruelest of passersby, he is happy to pass his day serenading our Capital City, singing a song only he knows, and continuing to plink away on one of Costa Rica’s only ukuleles. His true given name is Mario Bolaños Quirós, born in 1948. He lives in Los Cuadros, Guadalupe, on the outskirts of San Jose central, and his story is frankly a sad one. Although his age is over 60 years, his emotional state of mind is said to range more in the area of 14 years. At that age, his mother died suddenly, something he never quite overcame, stalling his mental development, leaving him literally stuck in time. It is believed he lives with his sister and has spent more than 40 years in his found “profession” as a street singer, living off the coins and small denominations that generous people drop in his iconic white bucket. He never begs, never has a foul word or bad mood for anyone, he is just happy to sing his song (I’m pretty sure there is just the one! ), dedicated to his long lost mother who he claims to be singing to in Heaven. Before making his musical home the boardwalk of Central Avenue, Marito spent his time on the sidewalks of the bus stops of Guadalupe, outside of San Jose and later around Avenida Tres, eventually making his “home” seated on Avenida Central and Calle 1, not far from the Librería Universal and the Tienda Carrión. It is extremely rare to see him anywhere else, arriving daily around 9am or 10am and leaving as late as 7pm or even 8pm at night! From time to time unscrupulous or rude people have been known to tease or bother him, playing jokes, even stealing his coin bucket, but the local lottery vendors, newspaper salesmen and store owners that work the same area jump to his defense to protect him. Marito takes it all in stride, happy in his own world existing of his white bucket (for the coins) and his precious ukulele, plinking out that same fingernail biting noise. In October of 2008, touched by his dedication to the city and the people of San Jose, the renowned painter, Carolina Rodríguez, who had donated her time to painting one of the famous fiberglass cows used in the “Cow Parades” so popular in Costa Rica, was present as the Mayor of San Jose, Johnny Araya, dedicated her precious work of art to be permanently located on Morita Mortadela’s special corner. All of this said to honor a person that has given his “life” to the capital city of San Jose and the people that traverse it daily. Unfortunately, after a wonderful dedication ceremony and several months of Morita playing his favorite Ukulele at the foot of his now personal cow sculpture, colorfully painted with pictures of Morita’s guitar across the sides, vandals destroyed the fiberglass cow during the night after an unruly party following the city wide Christmas Festival of Lights. It is suspected by the damage to the structure that party goers tried to sit on the cow sculpture, collapsing it under their weight and later leaving the now famous cow sculpture in ruins. Morita was beside himself, as was most of the city who was ready to lynch the vandals. “We vow to return Marito’s cow, there is no doubt in that”, promised Arias, the assistant to San Jose mayor, Johnny Araya. “The municipality sees this cow not only as a Public work of art, but as an urban monument and we will do what is necessary to return it to its original state. If there is a cost involved, we will pay it!” promised the municipality worker. 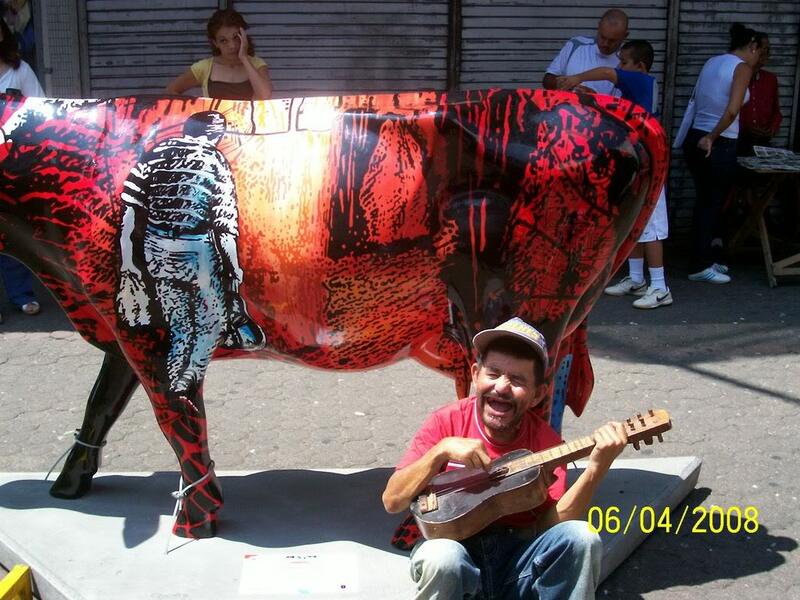 As a sign of the dedication to the beloved street artist, Mariano Morelli, Manager of Vallas y Gigantografías, the company that organized the Cow Parade in Costa Rica – the activity that promoted the creation of these cows—confirmed to the national newspaper, La Nacion, that they were in agreement to help in the repair of the cow, or if needed, donate a white cow to be repainted by the original artist. “We want to return Marito’s cow as soon as possible”, Mr. Morelli added. With the installation of added security cameras near the cow’s location, and improvement to the 5 other security cameras already located or due to be located in that general area of downtown San Jose, it is hoped that a despicable act such as this will not be repeated. Marito is said to be “very happy” to have his cow back in place and happily continues to entertain passersby on the Bulevar (Boulevard) in all types of weather, sitting at the base of his beloved cow, with his faithful white money bucket at his feet and his battered Ukulele plinking away. Since the cow donation, Marito officially boasts his own spot on the boulevard and has found a place in San José’s history books. So the next time you find yourself in San Jose, Costa Rica, be it for a Costa Rica vacation, a little shopping, because you live there, or while you’re lost on our streets with no addresses, when you hear that grating Ññññeee! Ñññññeeeeeee!! Ññññññññeeeeeeeeeeee!!! clin-clin-clin-clin-clin-clin racket, take a moment to stop, listen, and appreciate our chalkboard etching musical master. And while you’re at it……please donate a few extra coins to Costa Rica’s most loved Central American Idol, Marito Mortadela! !